Migrations of distinct ethnolinguistic groups have probably occurred as early as 10,000 years ago. However, about 2.000 BCE early Iranian speaking people and Indo-Aryans have arrived in Iran and northern India. Pressed by the Mongols, Turkic peoples subsequently migrated to the western and northern regions of the Central Asian plains. Prehistoric migrants from South China and Southeast Asia seem to have populated East Asia, Korea and Japan in several waves, where they gradually replaced indigenous people, such as the Ainu, who are of uncertain origin. Austroasiatic and Austronesian people establish in Southeast Asia between 5.000 and 2.000 BCE, partly merging with, but eventually displacing the indigenous Australo-Melanesians. In terms of Asian people, there is an abundance of ethnic groups in Asia, with adaptations to the climate zones of the continent, which include Arctic, subarctic, temperate, subtropical or tropical, as well as extensive desert regions in Central and Western Asia. The ethnic groups have adapted to mountains, deserts, grasslands, and forests, while on the coasts of Asia, resident ethnic groups have adopted various methods of harvest and transport. The types of diversity in Asia are cultural, religious, economic and historical. Some groups are primarily hunter-gatherers, whereas others practice transhumance (nomadic lifestyle), have been agrarian for millennia, or have adopted an industrial or urban lifestyle. Some groups or countries in Asia are completely urban (e.g., Qatar and Singapore); the largest countries in Asia with regard to population are the People's Republic of China, India, Indonesia, Pakistan, Bangladesh, Japan, Philippines, Vietnam, Iran, Thailand, Burma, and South Korea. Colonisation of Asian ethnic groups and states by European peoples began in the 16th century, reaching its peak in the late 19th and early 20th centuries (except in the former Soviet Union, which was dissolved in 1991). Central Asia, in its most common definition, is deemed to consist of five former Soviet Socialist Republics: Kazakhstan, Kyrgyzstan, Tajikistan, Uzbekistan and Turkmenistan. In a wider view, Xinjiang of western China, Mongolia, Afghanistan, and northern Pakistan are included. Turkic, Indo-Iranian, and Mongolic peoples comprise its general ethnicities. The main religions of Central Asia are Islam (Turkic/Indo-Iranian peoples) and Buddhism (Mongolia). Central Asia has a long, rich history mainly based on its geographical location along the ancient Silk Road. It has been conquered by Mongols, Tibetans, Persians, Tatars, Russians, Afghans and Sarmatians, and thus has a very distinct, vibrant culture. The culture is influenced by Chinese, Indian, Persian, Afghan, Arabian, Turkish, Russian, Sarmatian and Mongolian cultures. The music of Central Asia is rich and varied and is appreciated worldwide. Meanwhile, Central Asian cuisine is one of the most prominent cuisines of Asia, with cuisines from Pakistan, India, China and Azerbaijan showing significant influence from the foods of Central Asia. One of the most famous Central Asian foods is the kebab. The literature of Central Asia is linked with Persian literature as historically it has been part of the Persian Empire for a lot of its history. Furthermore, sitting at the junction of the Silk Road, it has numerous Chinese, Indian and Arabian literary works. East Asians is a term used for ethnic groups that are indigenous to East Asia, which consists of China, Hong Kong, Macau, Japan, Mongolia, North Korea, South Korea, and Taiwan. The major ethnic groups that form the core of East Asia are the Han, Joseon, and Yamato. Other ethnic groups of East Asia include the Bai, Hui, Tibetans, Manchus, Ryukyuan, Ainu, Zhuang, and Mongols. The major East Asian language families are the Sinitic, Japonic, and Koreanic families. Other language families are Tibeto-Burman, Ainu languages, Mongolic, Tungusic, Turkic, Miao–Yao, Tai–Kadai, Austronesian and Mon–Khmer. Throughout the ages, the greatest influence on East Asia historically has been from China, where the span of its cultural influence is generally known as the Sinosphere laid the foundation for East Asian civilization. Chinese culture not only served as the foundation its own society and civilization, but for also that of its East Asian neighbors, Japan and Korea. The knowledge and ingenuity of Chinese civilization and the classics of Chinese literature and culture were seen as the foundations for a civilized life in East Asia. China served as a vehicle through which the adoption of Confucian ethical philosophy, Chinese calendar systems, political and legal systems, architectural style, diet, terminology, institutions, religious beliefs, imperial examinations that emphasized a knowledge of Chinese classics, political philosophy and culture, as well as historically sharing a common writing system reflected in the histories of Japan and Korea. The relationship between China and its cultural influence on East Asia has been compared to the historical influence of Greco-Roman civilization on Europe and the Western World. Major characteristics exported by China towards Japan and Korea include shared Chinese-derived language characteristics, as well as similar social and moral philosophies derived from Confucianist thought. The script of the Han Chinese characters has long been a unifying feature in East Asia as the vehicle for exporting Chinese culture to its East Asian neighbors. Chinese characters became the unifying language of bureaucratic politics and religious expression in East Asia. The Chinese script was passed on first to Korea, Vietnam in the 1st century, then to Japan, where it forms a major component of the Japanese writing system. In Korea, however, Sejong the Great invented the hangul alphabet, which has since been used as the main orthographic system for the Korean language. In Japan, much of the Japanese language is written in hiragana, katakana in addition to Chinese characters. For the most part, North Asia is considered to be made up of the Asian part of Russia solely. 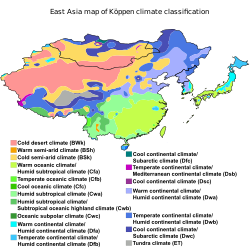 North Asia is geographically the northern extremity of East Asia and the physical characteristics of its native inhabitants generally resemble that of East Asians, however this is principally divided along political lines under separate national identities, particularly that of China, Mongolia and Russia. The main ethnic groups of the region speak languages of the Uralic, Turkic, Mongolic, and Tungusic language families, along with East Slavs and various "Paleo-Siberian" peoples, with most of these ethnic groups being composed of nomads or people with a nomadic history. The geographic region of Siberia was the historical land of the Turkic people, the Tatars, in the Siberia Khanate[dubious – discuss]. Russia, under expansion of its territory however, took control of the region now known as Siberia, and thus today it is under Russian rule. There are roughly 40 million people in North Asia. South Asia, in general definition, consists of the countries of Afghanistan, Bangladesh, Bhutan, India, Maldives, Nepal, Pakistan and Sri Lanka. The five Southern Indian states and north-eastern Sri Lanka share a Dravidian culture, due to the prominence of Dravidian languages there. The Brahuis of Pakistan also belong to Dravidian people group. Sri Lanka has two main languages, Sinhalese which has Indo-Aryan roots and Tamil which has Dravidian roots. Bangladesh and the Indian province West Bengal share a common Bengali language and culture. The provinces of Azad Kashmir and Gilgit-Baltistan of Pakistan share a common Dardic heritage with the Indian state of Jammu and Kashmir. Similarly the Punjab province of Pakistan and Indian state of Punjab share a common Punjabi ethnicity, language and culture. In Pakistan, the two western regions of Baluchistan and Khyber Pakhtunkhwa share a greater Iranian heritage and while the provinces of Sindh share a more Indo-Aryan culture. Iranian is most prevalent in Afghanistan, with significant Turkic speakers. Regions of Nepal and parts of the Indian states of Arunachal Pradesh, Himachal Pradesh, Jammu and Kashmir(Ladakh), Sikkim and Uttarakhand have cultural similarity to Tibet, Tibetan Buddhism being the dominant religion there. Finally the Northeast Indian states of Meghalaya, Mizoram, Manipur, Nagaland and tribal groups of Assam and Tripura have cultural affinities with South East Asia. Bhutanese are often referred to in their literature as "Bhote" (people of Bhutia/Bhotia or Tibet). They follow Tibetan Buddhism to and it is a dominant political and cultural element in modern Bhutan. Their language, Dzongkha, is the national language and is descended from Old Tibetan. Hinduism, Buddhism, Jainism and Sikhism, religions founded in the region that is today's India, are spread throughout the subcontinent. Islam and Christianity also have significant region-specific histories. While India and Nepal have a majority of people following Hinduism, Sri Lanka and Bhutan have a majority of Buddhists alongside Hinduism. Islam is the second largest religion after Hinduism with Muslim countries like Pakistan and Bangladesh. Indo-Aryan languages are spoken in most of North, East, West and Central India; Nepal; Bangladesh; Pakistan and Sri Lanka. 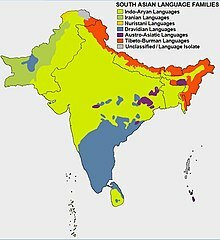 Dravidian languages are spoken in India, Pakistan, Afghanistan, Nepal, Maldives, Bangladesh and Sri Lanka. Tibeto-Burman languages are spoken in the hills of Bangladesh, Nepal, North and North East India. Austroasiatic languages are spoken in certain northern and eastern areas of Bangladesh, parts of Nepal and scattered across different zones of India mostly concentrated around Chota Nagpur Plateau and the state of Meghalaya. Iranian languages are most prevalent in Afghanistan and western Pakistan. Turkic speakers are significant in Afghanistan and parts of Pakistan as well. Southeast Asia is often split into two parts: Mainland Southeast Asia, comprising Burma, Cambodia, Laos, Peninsular Malaysia, Thailand, and Vietnam; and Maritime Southeast Asia, which includes Brunei, East Timor, Indonesia, East Malaysia, the Philippines, and Singapore. The region has been greatly influenced by the cultures and religions of India and China, as well as the religions of Islam and Christianity from Southwest Asia. Southeast Asia seems to be more influenced by India rather than China with the exception of Vietnam, which is considered part of the Sinosphere, and Myanmar, which has been equally influenced by both China and India. Southeast Asia has also had a lot of Western influence due to the lasting legacy of colonialism. One example is the Philippines, which has been heavily influenced by Spain and the United States of America over the course of almost four centuries of colonisation. A common feature found around the region are stilt houses, while another is rice paddy agriculture, which originated in the region thousands of years ago. Dance is also a very important feature of the culture, utilizing movements of the hands and feet perfected over thousands of years. Furthermore, the arts and literature of Southeast Asia is very distinctive as some have been influenced by Indian, Hindu, Chinese, Islamic and Buddhist literature. 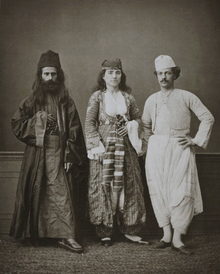 Traditional costumes of (from right to left) a Christian resident of Famagusta, a Christian woman of Famagusta, and an Orthodox monk of the Monastery of Tchiko, near Lefka. Photographed in Cyprus in 1873. West Asia is sometimes referred to as "Southwest Asia". West Asia consists of Armenia, Azerbaijan, Bahrain, Cyprus, Iran, Iraq, Israel, Jordan, Kuwait, Lebanon, Oman, Qatar, Saudi Arabia, Syria, parts of Turkey and Egypt, United Arab Emirates and Yemen. Culturally, the region's dominant ethnic groups are Arab (about 150 million), Turkic (about 60 million), Persian (about 50 million) and Kurds (about 35 million). Other indigenous minorities include Greeks (600 thousand), Jews (6.2 million), Assyrian (about 400,000), Armenians (about 4.5 million), Azeris (about 20 million), Mandaeans, Yazidis, Circassians, and others. Many of the West Asian countries are desert, and thus many nomadic groups exist today, most notably the Bedouin Arabs. ^ "Ethnic groups Prehistoric centres and ancient migrations". Encyclopedia Britannica. Retrieved September 23, 2018. ^ Sidwell, Paul; Blench, Roger (2011). "The Austroasiatic Urheimat: the Southeastern Riverine Hypothesis" (PDF). In Enfield, N.J. Dynamics of Human Diversity. Canberra: Pacific Linguistics. pp. 317–345. ISBN 9780858836389. ^ "New research forces U-turn in population migration theory". eurekalert. Retrieved September 23, 2018. ^ "Origins of Ethnolinguistic Identity in Southeast Asia" (PDF). Roger Blench. Retrieved September 23, 2018. ^ "From ethnocide to ethnodevelopment? Ethnic minorities and indgenous peoples in Southeast Asia" (PDF). JSTOR. Retrieved September 23, 2018. ^ Wang, Yuchen; Lu, Dongsheng; Chung, Yeun-Jun; Xu, Shuhua (April 6, 2018). "Genetic structure, divergence and admixture of Han Chinese, Japanese and Korean populations". Hereditas. 155: 19. doi:10.1186/s41065-018-0057-5. PMC 5889524. PMID 29636655. ^ "How was Hangul invented?". The Economist. 2013-10-08. Archived from the original on 28 March 2018. Retrieved 5 May 2018. Wikimedia Commons has media related to Ethnic groups in Asia. This page was last edited on 19 April 2019, at 14:56 (UTC).